8 am until 1 pm. Village of Winthrop Harbor, IL. AARP Driving Class 2019 class dates to be announced.. To sign up call the Township as space is limited. AARP members cost $15.00; non-members $20.00. ElderCare at Christ Church offers personalized medical trips for residents over the age of 65 (need 10 day notice). A donation is requested, but not required. They also have volunteers to help with grocery shopping and home visits. Call: 847-406-4683 or email: info@eldercarelakecounty.org. Neither age nor income a requirement. Pick up application at Township office. Free Senior Activity Guide Available at Township Office. Lending Closet @ Antioch Sr.Ctr 847-395-0139 anyone may borrow wheelchairs, walkers, etc. Handicap Parking Applications available at Township office. MEALS ON WHEELS call (847) 546-5733 ask for meals on wheels program. Northern IL. Food Bank provides a variety of Food at NO CHARGE. 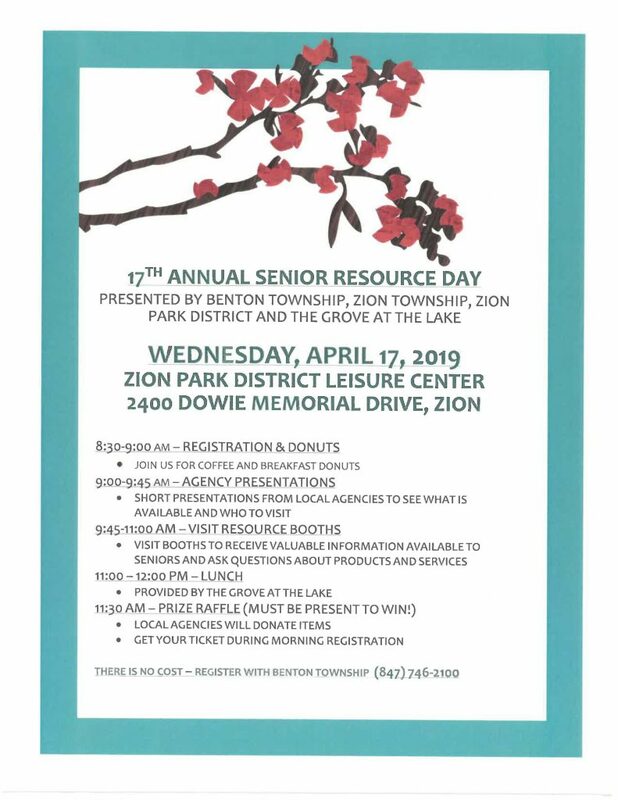 Open to anyone 60 years of age or over (age 55 if ZPD Senior Club member). Need Driver’s License or State I.D. for age approval. Discount Half price taxi fare for seniors 65 + and disabled residents. Maximum up to $5.00. Must apply in person at the township office to get your ID. For ALL Benton Township residents. Service available Monday thru Friday 8:30 a.m. to 5:30 p.m. Must call 1-800-201-6446 one day in advance to secure a seat. Area Served: Beach Park, Winthrop Harbor and Zion. Also Tuesdays & Thursdays 8:30 a.m. to 3:30 p.m. Gurnee and Waukegan area for shops and medical appointments. You may call 7 days in advance to reserve a seat for medical appointments (Tuesdays & Thursdays only).